The other day Robert was going to the lake with some of his friends. They were going to grill out and get caught up on each others lives. 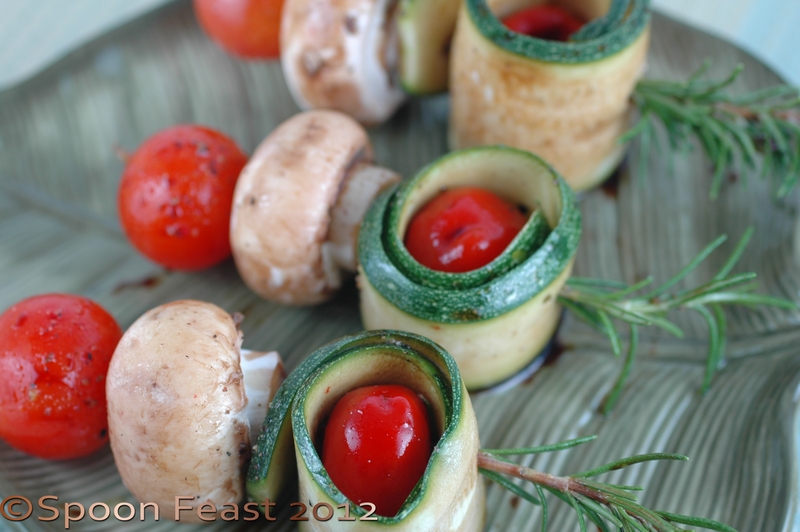 He asked me if I could make a vegetable they could grill so I made these vegetable kabob on rosemary skewers. To make these skewers, cut the rosemary twigs on a bias to form a point. Slice zucchini very thin the length of the zucchini. 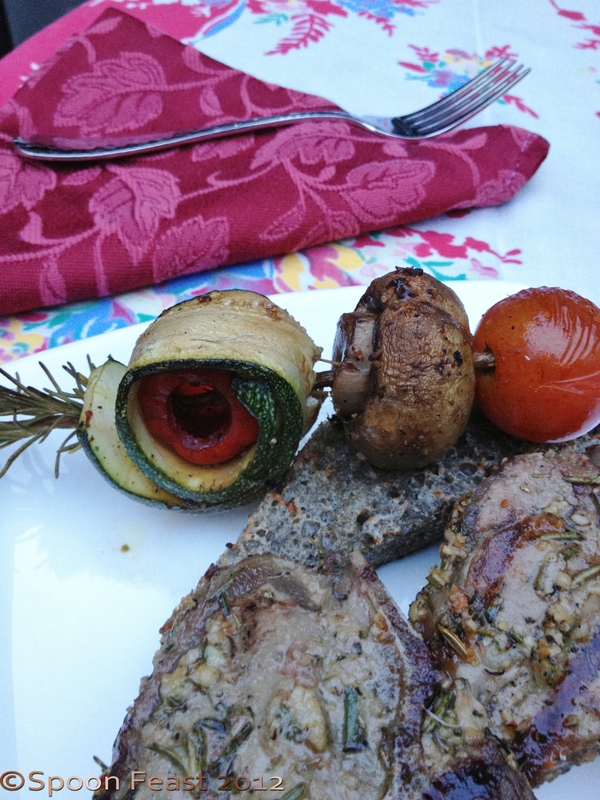 Wrap the zucchini around a drained pappadew pepper, thread it onto a rosemary skewer. Next, thread a button mushroom, the top with a cherry tomato. Marinade in a balsamic vinaigrette for at least 30 minutes. Season each skewer with kosher salt and pepper. Grill on each side for 2-3 minutes each side or cook over indirect heat for about 8-10 minutes. Since Robert does not eat red meat, when he stays out I usually turn into a carnivore. This particular evening I had some beautiful lamb chops marinated in garlic, rosemary, mint, lavender, oregano, olive oil, and black pepper. We grilled fresh buckwheat bread seasoned with olive oil and rubbed with raw garlic. Marvelous. I had some mint sauce I made from an arm load of mint during the summer so I couldn’t wait to eat some lamb. With Robert away, my friend Joanie and I grilled and set the table in the courtyard, poured some wine and had quite a feast. All because of a rosemary vegetable skewer. This entry was posted in basic skills, Cooking and tagged Black pepper, Cherry tomato, cook, grilled vegetable skewers, grilled vegetables, grilling, Marination, Olive oil, rosemary skewers, Skewer, Zucchini. Bookmark the permalink.